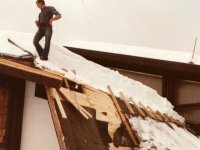 During the development of the Kling snow retention clamp (utility model registration in 1962), we applied the findings of the original avalanche protection barriers, as they have always led to success on slopes exposed to avalanches with horizontal fencing. The established Kling snow retention system for the industrially pre-profiled roof. 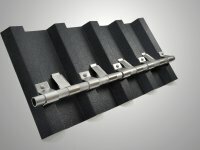 Profile roofs with round head profiles made of Bemo® and Kalzip® etc. can be secured against falling snow. The protection against roof avalanches. 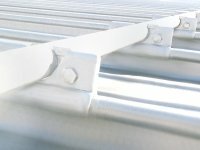 The system prevents snow slabs and roof avalanches. The system ensures the harmless stretching movement of the sheets. 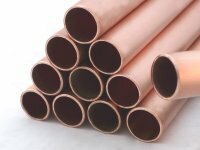 The installation requires a small amount of time. The roof skin is stabilized against gusts and eddies of wind. and ice from falling off roofs. 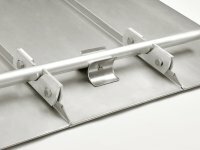 are attached to the longitudinal seams of the roof sheets with clamping plates. between the snow retention tubes and the surface of the metal.